Founded in 2005, TechStar has spent the last 14 years architecting IT solutions for their clients with a main focus on customer service. They have grown, moved, and added staff, but the focus remains the same as it was on day one… listening to their customer’s needs and finding the right solutions to make their businesses run better and be more successful in all they do. What is your business and what are your needs? What is the best custom solution to fit those needs? What are the pros and cons of that solution? What solution would we select if this was our business? Focusing on the answers to those questions is what makes TechStar a stand out partner in the IT industry. For Paul, his goal is to constantly be the best. The best IT partner. The best team. The best boss. One of the things he enjoys most about TechStar is the opportunity to sit with clients and marry technology with business to architect the perfect solutions. 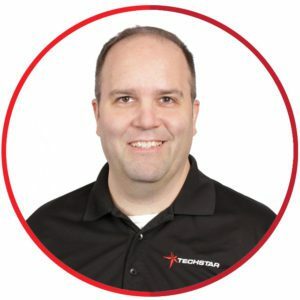 As he says, “I’m constantly asking myself when I am with our clients, if I owned this company, what solution would I want?” That question keeps him and the TechStar team focused on providing the best and most efficient solutions to their customers every day. Paul enjoys reading, playing racquetball and spending time with his family. If he could have a superpower, it would be to make everyone happy, the sign of a true TechStar. “I enjoy being able to help define and refine processes, looking at solutions and how they will scale over time for our customers.” Nate works hard for TechStar’s customers to find inefficiencies in their systems and provide them with simple solutions to complex problems. Making technology a bit easier for customers to understand is a main focus for Nate. 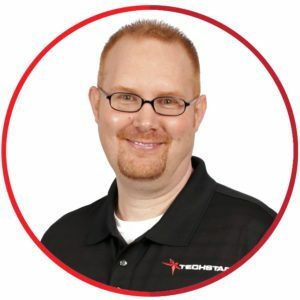 Nate specializes in network architecture and Level 1 design, and is fluid in cloud services and solutions. He is also fluent in a wide range of operating systems including Mac OS, Chrome, iOS and Android. When he’s not at TechStar, Nate loves hanging out with his three kids, playing with home automation and home theatre technology, and building custom computers. If he could have a superpower, it would be invisibility. Now you see him, now you don’t! 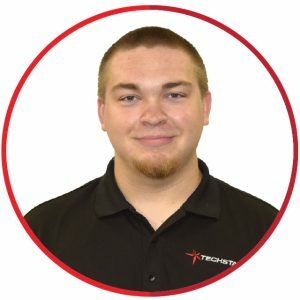 “I love getting to play with computers every day, figuring things out and making them work together.” Matt enjoys the customer service and hardware aspects of his job, being able to solve problems and provide solutions to satisfy his customer’s needs. At the end of the day, hearing it’s a job well done is the most rewarding part of being a TechStar. Matt’s story of coming to TechStar is very interesting. He was working at a local grocery store when Paul spotted him and noticed his customer service skills. Those skills led Paul to approach Matt to come to TechStar. Little did Paul know at the time, but Matt was just completing his last semester in college, earning a computer support tech degree. The stars aligned perfectly and Matt came to TechStar as a systems engineer. When he’s not at TechStar, Matt enjoys riding his motorcycle and building custom gaming computers. If he could have a superpower, it would be to have super speed, although he notes that with that one requires the ability to withstand the speed. Let’s chat today about your needs and goals. It all starts with a conversation. We want to hear from you about your business, your needs and your goals. We’ll ask some questions and listen to your answers. Then, after we’ve talked through where you’re at today and where you want to be tomorrow, we’ll prepare a strategy that addresses your specific needs. No canned solutions. No sales pitches. Just a partner you can trust to give you the best expert advice and provide the highest level of service. Call or email us today to start a conversation.